Disclosure: Ultiworld Disc Golf was compensated for writing this product review. All opinions are the reviewer’s own and are not subject to approval from the sponsor. Please support the brands that make Ultiworld Disc Golf possible and shop at Friction Gloves. This review was always destined to begin with an episode from about three weeks ago. With daylight savings time still so far away, I sped to a nearby course after work to throw a few holes. The rain came out of nowhere, as it often does in Atlanta, and I was caught in a downpour. I continued to play, without thinking that the beat-in Innova Roc I was throwing with was a disc I couldn’t live without. Then, disaster. It slipped out of my hand on a drive and fell directly into what would have been a normal creek, if not for the storm. Instead, it was a raging river. Without hesitating, I jumped into the freezing cold waters. Amazingly, I emerged with my favorite disc, but as I warmed up in the car I began thinking: What could have possibly happened to my grip there? Enter Friction DG Disc Golf Gloves, my only hope. Friction Gloves offer a nice, tight feel to the hand. If you’ve ever worn baseball or golf gloves, the fit is very similar. They’re just thick enough to prevent cold weather from making fingers go numb, but through lots of snow you may have an issue. There is some “give” to the material, so I expect these to last quite a long time. After multiple uses, there isn’t a bit of tearing or wear. That being said, these gloves are coming off for my putts. Regardless of the weather, when I’m putting from inside 40 feet I need to be able to feel the disc in my hands. It’s possible that for players that utilize a throw putt it could be different, but I found that short putts with the gloves on just had a bit too much inconsistency compared to just throwing a wet disc with my bare hand. Once I had the gloves, I wanted to replicate that downpour from a few weeks back. So, I went out throwing early in the morning with dew on the ground and a bucket of water by my side. After dunking the disc in the bucket, I tried, bare-handed, to throw my drivers and midranges to a net around 350 feet away. As you might expect, the discs slipped out early and mostly finished left. As I tried to compensate, they turned over and finished right. For the true test of the Friction glove, I repeated the process. On the first few throws, it didn’t feel like there was much improvement. But the discs flew where they were supposed to, without being over-gripped on a backhand. The more I threw, the more it seemed like they were working exactly as advertised. As I started to pack up, I decided to practice a few sidearm drives. After that round of testing, I fell in love with the glove. With a wet disc and a sidearm throw, my bare-handed grip was completely absent. But with the glove on, I had significantly more control over where my throws were going. Of course, there is the occasional issue. For instance, I consistently had trouble with the first throw each time I put the gloves on. There are tiny adjustments that need to be made that make it feel just different enough to throw off a shot. So, if only one of my shots goes into the water during a tournament, I’m still resorting to the towel instead of the glove, assuming the weather is appropriate. Friction Gloves are available online for $14.99 for one glove, and $24.99 for the pair. They’re available in six different sizes, with a handy chart to help you decide which will suit you. After shipping, the price you’re paying for one glove is comparable to that of a higher-end disc. So is that price worth it for the traveling tournament player? With traveling players investing hundreds of dollars into discs, bags, shoes, and other accessories, getting a glove that lets you virtually forget about inclement conditions is well worth the price. If you’re just starting out, though, consider holding off. For an extra few dollars you can get a small bag, or other accessories that you might use more often. These gloves are absolutely going in my bag. While I won’t be using them when I don’t have to, being able to throw them on to cope with inclement weather is a must-have for people who participate in tournaments. For the casual player, they may not be a necessity. If bad weather is going to keep you off the course in the first place, then you obviously don’t need to spend the money. If you play in the cold, however, these still are an excellent solution. No one can clearly predict the conditions at a tournament. Even on a sunny day, morning dew or leftover mud can ruin your next shot. 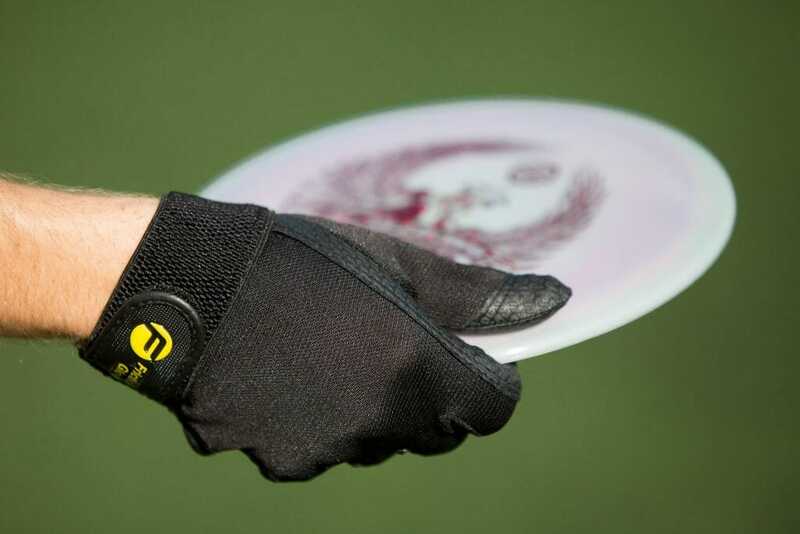 And in those instances — where every shot counts — Friction DG Disc Golf Gloves are a must-have for the traveling player. Ultiworld Disc Golf has partnered with Friction Gloves to give away three pairs of their product. Just enter the raffle below and you’re set! Preston Thompson has been a writer for Ultiworld Disc Golf since 2016. He is a graduate of the University of Alabama, and has been playing disc golf for seven years. You can reach him by e-mail (preston.james.thompson@gmail.com) or follow him on Twitter (@pston3). Comments on "Gear Review: Friction DG Disc Golf Gloves"